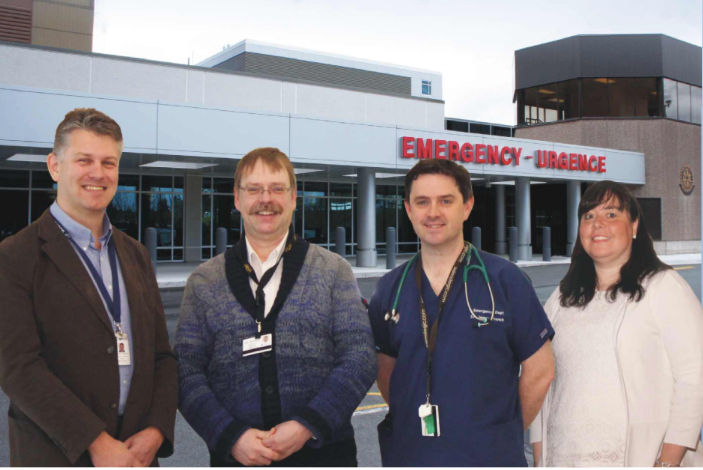 The Dalhousie University and Horizon Health Network emergency medicine research program was established in 2010 at the Saint John Regional Hospital Department of Emergency Medicine with a remit to investigate patient oriented outcomes and to achieve improved patient care through research and knowledge translation. The program collaborates with other sites in New Brunswick as leader for the provincial research committee, and partners with other programs on the Dalhousie University Department of Emergency Medicine Research Council. The research team consisting of several physicians, nurses, residents and medical students has a successful publication record, and has presented original research at local, national and international conferences. We have investigated strategies to reduce burnout in the ED staff; examined protocols to improve outcomes in cardiac arrest and shock. We have also compared Trauma outcomes between advanced and standard systems, as well as looking at clinical issues such as pain control, shoulder dislocation, sedation for children among others. Our current areas of research include medical education, point of care ultrasound, trauma systems and injury prevention, as well as several areas in emergency medicine. Our education research has led to curricular advancements in undergraduate and postgraduate programs. We partner closely with the Dalhousie Departments of Emergency Medicine and Family Medicine. In 2014, the team received the Grant Innes Award for top research at the Canadian Association of Emergency Physicians (CAEP) national conference, and in 2015 placed second. Students and residents in the program have been awarded Top Medical Student Research Project in Emergency Medicine (CAEP 2015 & 2016), top family medicine research project (Dalhousie University 2014, 2015 & College of Family Physicians 2015). October 2018 – @SJRHEM is proud to have led a team of international PoCUS researchers to the completion and publication of the first RCT examining clinical outcomes with ultrasound in shock. POCUS has been touted as the stethoscope 2.0, a true game changer in patient care. There is no patient population that this statement should hold more true for, than in patients with undifferentiated shock (SBP <100mmHg or SI > 1). Everyone has a story about how ultrasound changed their management or even saved a patient’s life. Unfortunately, the plural of anecdote is not data. To date, there have not been any prospective randomized controlled trials examining POCUS outcomes on survival in this population. Enter the Sonography in Hypotension and Cardiac Arrest in the Emergency Department (SHoC-ED) trial. Biannual EM review summaries, the full series. Each year we supervise several Research in Medicine (RIM) students from Dalhousie Medicine New Brunswick. Previous RIM students have received local, regional and national research awards. Please contact Jackie Fraser for RIM project information. We are members of several research networks including the Dalhousie University Emergency Medicine Research Committee, the Canadian Association of Emergency Physicians (CAEP) Research Committee, the Canadian Resuscitation Outcomes Consortium (Can-ROC), and the New Brunswick Trauma Program. Research partnerships have been established with Dalhousie Medicine New Brunswick; Departments of Family Medicine, Emergency Medicine, Infectious Diseases & Pediatrics, Public Health, and Psychology; Horizon Health Network Research Services; Universities of New Brunswick, Manitoba, Calgary, Memorial, Cape Town, and Cambridge; the Canadian Centre of Vaccinology, the International Federation for Emergency Medicine; and staff of the Saint John Regional Hospital ED. The site also initiated the formation of a Dalhousie DEM Ultrasound Research working group which has evolved into a national PoCUS research section of the CAEP Ultrasound Committee.